Please don't hate me. I know I'm supposed to love them, and have kale, spinach, or collard greens with every meal, but I just can't. And please don't say that I'd love them if only I covered them in bacon drippings. It's just not going to happen. So, I get my fill of dark leafy greens from salad and smoothies. But sometimes, they still pile up. Anyone else have an overwhelming and growing mound of greens in their crisper drawer? To preserve all this leafy bounty for future dishes, I turn these greens into a batch of nutritious green powder. In the following directions, I'll show you how to do this with fresh, raw greens. If you'd like to steam dark leafy greens first to reduce their oxalic acid*, simply steam then drain the greens — then dry and powder. In addition, feel free to skip trimming off the stems (step 3) because the steaming softens them. Easy peasy! *Oxalic acid is an anti-nutrient found in dark leafy greens that inhibits mineral absorption. Click here for more info. Think lettuce, spinach, kale, collard greens, and anything in between! Yes, you really can dehydrate lettuce. Do your greens have any woody or pulpy stems and veins? Compost them or feed them to your chickens! I find that they don't grind down well into powder without a lot of work. I take the leaves outside and shake off as much moisture as possible, then set them on my kitchen counter on tea towels in layers to dry. The less moisture on their surfaces, the less time in the dehydrator. It's okay if they touch. Leaves shrink up to 1/4 to 1/3 of their size when dehydrated, so there's lots of room for movement. Just don't stack them on top of each other. You can also use the Herbs setting on your dehydrator, although lettuce and greens are sometimes heartier than herbs (but less hearty than veggies), so I set my dehydrating temp to the lower end but a bit higher than herbs. Greens usually dry without 4 to 8 hours, depending on the moisture of your home, the moisture of your greens, and your dehydrator. If you prefer to go more quickly, set your temperature to the Vegetable setting (or 125 degrees Fahrenheit). Just keep a close eye on it. If you don't have a dedicated dehydrator, set your oven to its lowest temperature. Lay your leaves on cookie sheets with the cake cooling grids on them. Then place in the oven, and prop the door open. Not only do you want to keep the oven temperature down, but you want the air to circulate and not trap moisture inside. That's right! Once the leaves are dry, whir those puppies up in your blender or food processor. For any larger flakes left behind, return those to the blender and whiz them up again. It takes 2 to 3 full dehydrator cycles to fill a quart-sized jar. Don't let that seem daunting! You've now got concentrated iron, magnesium, potassium, vitamin K, vitamin C, vitamin E, phytonutrients, and small amounts of omega-3 fatty acids. It's a powerhouse of nutrients in that little jar. Sprinkle a tablespoon in your morning smoothie! Add to salads for a boost of flavor and nutrition. 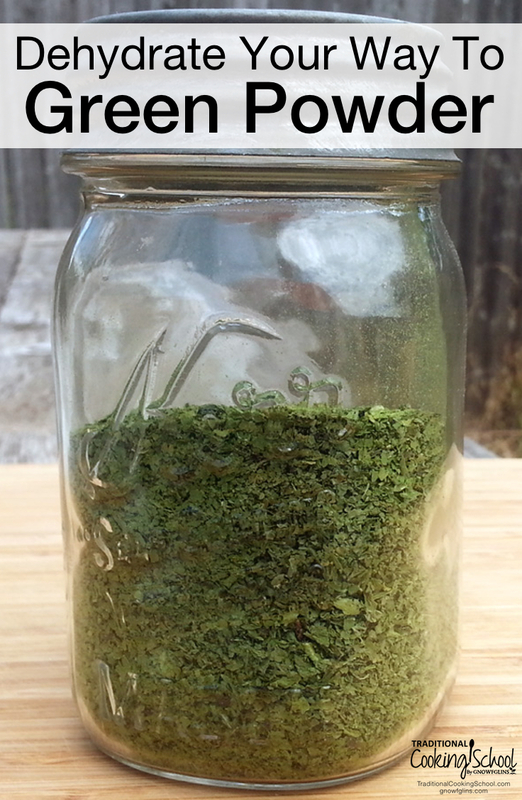 Create your own herbal mix out of green powder, other herbs, and dried zests. Add to soups for extra seasonings, or if you've run out of parsley! Get creative! Pasta, hamburgers, fritattas, stews, chilis, and more are all waiting! Have you ever thought to dehydrate greens into powder? For more dehydrating goodness, become a Traditional Cooking School member and you'll get total access to our Dehydrating eCourse (plus all our other classes). Click here for more info. Also, check out our free resource — The Dehyrating Tools Guide! Realizing that her family wasn't prepared for the next localized disaster, much less their own personal disaster like a job loss, Jane Baldwin began, in earnest, to find those ways to help better prepare her family to be ready for what life throws at them. Between teaching her boys reading, writing and the art of suburban survival, learning the importance of preserving whole, nourishing foods for her family and working her way through the list of homesteading skills she needs to master, you'll find her blogging at Mom with a PREP and spending way too much time pinning like mad, so she pleads that you ignore the chocolate fingerprints on her keyboard and the pile of (mostly) clean laundry at the foot of her bed. Been doing this for several years and I love it. I have big jars of green powder which get me through the winter. I use it mostly in eggs and smoothies. What do you think of using dandelion leaves? They’re a green! Think of it this way, if you would eat it in a salad or as a side dish, it will work! Just make sure that you are using leaves that haven’t been treated by a weed killing spray or other toxic lawn chemicals, and wash them well! How about broccoli leaves? Are they edible and can you dry them into a green powder as well. I have some plants that I am about to pull up and replant for fall harvest. Don’t like to waste anything. I can tell you broccoli leaves work great. They are definitely edible and dehydrate well. They sure are. The younger the leaves, the better they are raw, but you can also dehydrate. Just remember, large leaves are fairly fibrous and might be harder to ‘crush’, so you might need to do them two or three times in a blender if you’re having trouble getting them small enough. Terri, you dehydrated horseradish leaves? I have horseradish and I’ve been wondering what to do with the leaves. Do you have any information on common edible grasses and weeds in one’s back yard? My family is ready to spray a bunch of junk on the yard so it will look nicer, but I thought maybe there are things growing that may be useful? If so, can they be dehydrated as well? I live in ND. Hi, RG! Edible weeds and grasses are available everywhere! And once you begin spraying toxins on them, they aren’t as healthy for you. Here is a list of articles about various edibles in your landscape that you can read to get yourself familiar with and to share with your family. This is encouraging; I dislike throwing away picked greens yet can’t seem to use them up before they go bad. Thanks for “teaching” on this topic. You’re welcome! Hope it works out well for you! Thank you for this post – it is a great way to use those greens! I read Katie Baldridge’s post a couple months back about steaming greens to reduce the oxalic acid present in them. It seems to me if you take this step before dehydrating it would be a wet gooey mess on your dehydrator trays! Have you tried taking this step first? I imagine it would take quite a bit longer to dry as well. I’ll have to try this. We had a lot of kale last year and got tired of eating with bacon. I’ll keep this in mind. I like the idea of mixing it in with meatloaf. what about the oxalates in dark leafy greens? Do you think they are neutralized somehow in the dehydrating process? Rhonda — We mentioned this in the post. You can steam and drain the greens first to reduce oxalic acid. It’s very easy to do! Thanks so much for this! We were given a big bag of spinach and although I am using it in smoothies, it is starting to go bad so I am excited to have a way to use it so it doesn’t go to waste. I am trying this now, the only problem I have is that the leaves want to blow off the rack while I’m trying to put it in the dehydrator. Tesh, is your dehydrator already on when you are putting the trays in? Do you happen to have another fan on in the room? Kale is pretty hearty and shouldn’t move much. Jane, yes it was on. And I was dehydrating spinach. I’ll try it again. I think the other commenter wanted to know if the process of dehydrating would be equal to precooking to reduce the acid. I was wondering the same thing? Is the temp high enough or will it only work if you cook them? I am wondering this, too. That’s what I thought the other commenter was asking as well. I’m assuming that since the author’s reply just pointed back to the post the dehydrating process must not reduce the acid. I think if you use the powder in something you will cook, the powder will rehydrate and the acid will be reduced in the cooking process. So, if you want to use it for smoothies or to sprinkle raw on salads you will probably have to steam it first. Do you have a ratio you use for mixing the greens together like mostly spinach with other stuff as accents, or do you just dehydrate, blend and mix all willy-nilly? Will-nilly is pretty cool, but I was just curious taste-wise if you had a preference. We blend as we go. So whatever is fresh and ready to be dehydrated is the next thing that goes into the powder. Our dehydrator runs constantly, so it is pretty willy nilly what goes in next! We just make sure to mix it up well to make it well blended so that no one flavor overpowers another. That makes sense! That is sort of what we have been doing as well. Had to shut the dehydrator off for the night because I just needed a break from the noise. Plan to get it fired back up in the morning! Great idea. I think I’ll do this, my friends all grow too much kale so I end up with loads. Just an fyi though… vitamin C is destroyed with heat. Thanks so much for this! I just started working on my first jar. I have a few questions.. what can I do to make kale last longer in my fridge? Often i have every intention of drying but it can take me a few days to have enough time to prep for dehydration and by that time they’re slimy! I purchased a small vacuum sealer and tried that (perhaps very foolish) and through crushing them they rotted within a day.. oops. Second question is how to store the powder. I have the jar in the fridge, but when I take the jar out condensation forms so I’ve introduced moisture- guessing another rookie mistake. If you just keep in a cool/dark place, how long will it last and is it possible to extend powder life via refrigeration or freezing? Thanks again! Kim, I know you asked this a couple years ago but I just read it. I’ve found that if you wash your greens and remove most of the moisture from them, then put them in a ziplock bag with paper towels, the paper towels will absorb the extra moisture as well as help keep them from drying out. I’ve found that they last longer in the fridge like this. So if I want to keep greens in the fridge for a while without dehydrating them, this is how I do them. I cannot tell you exactly how much longer they will last (this also depends on how much moisture there is), but do know they last longer. Hope this helps. Can we sun dry the greens? Can you do Cabbage like this or would the flavour be to strong? I’ve never done it, but give it a try! I’ve dehydrated cabbage and carrots to make sauerkraut but have never rehydrated them. They dehydrate well, with only a little discolorization. Just like with any form of cooking, dehydrating can remove some nutrients, but that’s also why it is important to make sure you’re dehydrating at the appropriate temperature level for the product you want to dehydrate. For the most part, we aren’t trying to cook the food (unlike with making jerky), we’re only trying to remove the moisture. Thus you don’t want to dry your herbs at a super-hot setting or you’re just cooking them. Could I use my oven to dehydrate these? I don’t own a dehydrator yet. Thanks for any info you can provide. This dehydrated greens is a great idea! Yes, you can, but make sure you follow the directions for oven drying, keep your oven open a tad in a safe environment, so that you aren’t using too much heat. This is excellent. Do you have any idea of the ratio of fresh to dehydrated as far as nutrients are concerned? I usually make a morning smoothie with 3 cups of fresh green leafies. I’m wondering how much of the powder I would add to gain the same nutritional benefit? and thank you for this! You always loose a little in dehydrating, just like any preserving method. If you prefer fresh, use it! But we keep this to use on so many other things that fresh won’t do, it’s worth having! And you’ll have some stored away in case your garden isn’t producing or you haven’t been to the store! This is such a great idea! We usually use all of our spinach but of course there are times when it goes bad. I’d also love to be able to sneak it into other dishes. To answer the question about cabbage- Cabbage is great in the dehydrator. I was introduced to a “cole slaw” type recipe to dehydrate and it is amazing. Crunchy, flavorful, good by the handful or added on top of a sandwich or snack where you want a bit of crunch. I haven’t ground it up into a powder. I do this in my oven with a pilot light….just shove gobs of greens, herbs etc in one day and when I remember it 4 days later, everything is perfectly dry. How long will the greens last in the jar? Lori, as long as you keep them in an airtight container with an oxygen absorber, they’ll keep for 8-12 months (and longer if you do long-term storage like mylar bags, etc.). We keep our working bottle next to our prep area and never notice a change in quality for the jar we open daily. We go through it a ton, so we never have any particular batch last over three months. What about blanching? I tried solar dehydrating a bunch of mustard greens last summer and they came out tasting like dried hay. Are they still nutritious? Blanching is suggested to help bring out vital nutrients, but I’m not sure how it will effect the final outcome. You’re still removing all moisture from the leaves and stems. Powdering it makes it great for incorporating into other foods to add nutrition without the “icky cooked green stuff” texture that my kids don’t like! Do you know the conversion from fresh to powder? for example, how much powder equals one cup fresh? I’ve never done a correlation that way with it, Mandie, epsecially since I mix them all up. It would depend on which greens you are using and how tightly you pack them. But if you’re wanting to know how much to put into a smoothie, that’ll be a personal taste decision. Start putting some in and stop when you feel the texture and flavor are no longer optimal. I’m more wondering because I’m pregnant and currently taking Bradley method classes. They have me tracking my food and want two servings of greens a day. I’m just hoping for a ballpark figure as to how much powder would equal a serving. Do you happen to know a rough estimate of measurements? For instance, what would 1 cup leafy greens be equivalent to with the powdered greens??? 50 grams of collard green will reduce to 8 grams which is 4 teaspoons. I hope this helps. I was trained as a chemist and look at things a little deeper. It is strongly recommended by most Agriculture Extension departments in University systems to blanch vegetables with steam or boiling water which of course is different for each vegetable. I am sure the Oregon State University has such resources on line. I am a misplaced Oregon tree hugger that has been visiting Minnesota for 57 years. I strongly recommend blanching the cabbage and any other crucifer in boiling water to remove the goitrin that reduces thyroid production. We do have an epidemic of hypothyroidism in this country due to the fluoride in the water, flame retardants, water repellant products and of course consumption of raw crucifer vegetables. The Extension Service for South Dakota, Minnesota and Iowa suggest not breaking down the leaves until they are ready to be used. This provides less surface area exposed to degradation of nutrients. For cabbage Nebraska Extension suggest 1.5 minutes of boiling water blanching followed by cooling down the leaves immediately to 120 degrees and Cornell University Extension suggests drying between 100-110 degrees. I recommend vacuum packing the leaves in Kerr quart jars for further protection and storing them below a temperature of 60 degrees. Darn! I wish I’d seen this brilliant idea before I whizzed up and froze greens in ice cube trays. And I REALLY wish I’d seen it before I cut back all my mint and composted it. Betting dried mint would be terrific in smoothies. Why don’t you blend the leaves first, then dehydrate the blend? This would give you a much larger space to exploit on the trays. Of course you’d need to cover your trays with an adequate surface first, but that’s easy. This post came at the right time. I have a bunch of greens I got in my CSA. I don’t particularly like the taste of them so this is perfect, and they won’t just end up in the compost pile. Will be doing it today. Do nasturtium leave contain oxalic acid? Have frozen them before but wondering if I should blanch and then dehydrate. Very interesting topic. I shaddow dry moringa leaves and they get dried in one day and night in out hot climate (India). I mix half tea spoon in my chill yogurt and it tastes great like mocha ice cream.